Qantas was founded in Winton, Queensland and the name is an acronym for Queensland and Northern Territory Aerial Services. The airline was founded in 1920 and expanded to include international flights in 1935 with a service from Darwin to Singapore. Qantas, nicknamed ‘the Flying Kangaroo’ is Australia’s largest airline, the second oldest in the world, and a founding member of the oneworld alliance. Qantas has operated a number of subsidiary airlines over the years and currently has Jetstar Airways operating as its low-cost carrier on both domestic and international routes. Qantas flies to 21 international cities in fourteen countries across Africa, the Americas, Asia, Europe and Oceania. In the entire Qantas group, including Jetstar, there are 65 domestic and 27 international destinations. Qantas operates the world’s longest passenger flight, non-stop service from Sydney to Dallas aboard the Airbus A380, the world’s largest passenger aircraft. Qantas’ fleet is made up of Boeing 737-800’s, A380’s and a new fleet of Dreamliners introduced in 2018. There are 12 Boeing 747’s currently in service that are gradually being retired and replaced by A380’s and Dreamliners. Qantas and its subsidiaries operate 284 aircraft, which includes 70 aircraft by Jetstar Airways. First Class is offered only on the Airbus A380. It has fourteen individual suites in a 1-1-1 configuration. The seats face forward for takeoff, but rotate to the side for dining and sleeping. Seat pitch is 83 inches, extending to a fully flat bed, and with a width of 29 inches. You’ll enjoy the Bedding Down service which includes pillows, blankets, a duvet and sheepskin mattress. Each suite has a 17 inch widescreen with 1,000 AVOD programs. In addition to 110v AC power outlets, USB ports are offered for connectivity. Passengers are also able to make use of the on-board business lounge on the upper deck. As well as the Amenities Kit featuring SK-II skincare products you will receive pyjamas, slippers and socks. Upon arrival, you will be among the first to leave the aircraft and your bags among the first to be ready for collection. Read our review of flying in First Class with Qantas. Chauffeur Drive is available to all First Class passengers at a range of destinations. If you are departing from Sydney or Melbourne a First Host will call you the day before your travel to ensure you have everything your require available in the First Lounge. There’s a dedicated check-in area and you’ll be fast-tracked through immigration. There will be a dedicated boarding lane at the aircraft gate for you. 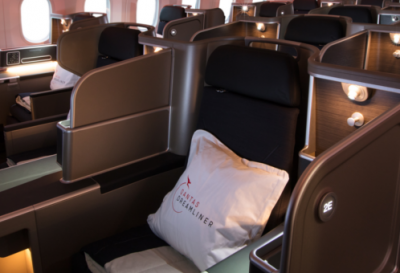 Business Class is offered on all Qantas passenger aircraft with fully flat beds. There are 2 business class seats and configurations currently available on Qantas long haul flights. The A380- aircraft have an older product and a 2-2-2 layout Read our review of Flying A380 Business Class. 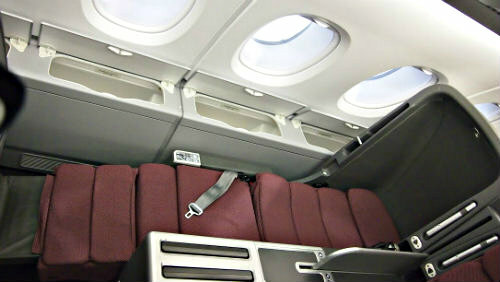 The 330’s and the new Dreamliners feature the latest generation business class seat. Read our review of flying business class on the new Qantas Dreamliner. 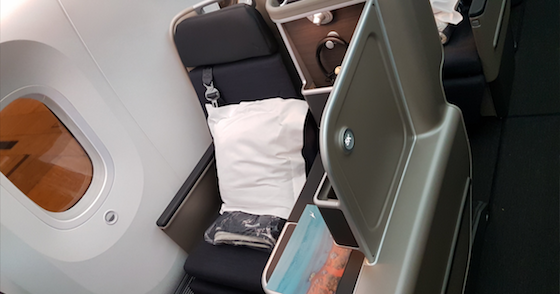 Qantas’ Sleep Service including pyjamas is available on selected flights to Los Angeles, Dallas, Johannesburg, New York, Singapore, London, Hong Kong, Tokyo, Bangkok, Jakarta, Shanghai and Manila and includes a new mattress, duvet and turndown service. Amenities Kits skincare products, eyemask, earplugs, socks, toothbrush & paste. Premium Economy Class is available on the A380, Boeing 747-400’s, and Dreamliners. It has a seat pitch of 38 inches on the Boeing 747 & it ranges from 38-42 inches on the Airbus A380, with a width of 19 inches. On the Boeing 747, it is configured in a 2-4-2 seating arrangement around the middle of the main deck, whilst it is in a 2-3-2 at the rear of the upper deck on the A380. Seats have an adjustable headrest, the centre and side consoles offer extra elbow room and Premium Economy cabins are sized between 32 and 40 seats. You’ll have a 10 inch personal entertainment screen and be provided with noise-cancelling headphones. Passengers will be able to use the dedicated check-in desk at the airport and have priority access to a dedicated boarding lane, then on arrival have priority disembarkation. 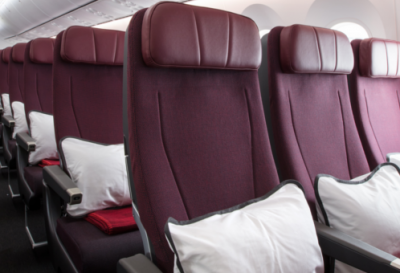 Economy Class is offered on all Qantas passenger aircraft. Seat pitch is usually 31 inches and seat width is 17 inches with built-in lumbar support and adjustable headrest. Layouts are 3–3 on the 737, 2-3-2 on the 767, 2-4-2 on the A330 and 3-4-3 on the 747. On the A380, the layout is 3-4-3 and there are four self-service snack bars located in between cabins. Read our review of flying Jetstar A330 Economy. To join the program, passengers pay a one-off joining fee, and then become a Bronze Frequent Flyer. Accounts remain active as long as there is points activity once every eighteen months. Flights with Qantas and selected partner airlines earn Status Credits — and accumulation of these allows progression to Silver status (OneWorld Ruby), Gold status (OneWorld Sapphire), Platinum and Platinum One status (OneWorld Emerald). 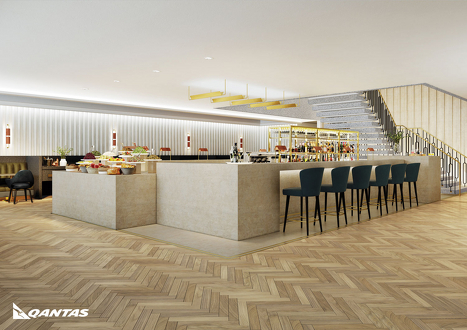 The Qantas Club is the airline lounge for Qantas with airport locations around Australia and the world. The Qantas Club offers membership by paid subscription (one year, two years or four years) or by achievement of Gold or Platinum frequent flyer status. Benefits of membership include lounge access, priority check-in, priority luggage handling and increased luggage allowances. Qantas has a flagship Lounge in Singapore, The Qantas Singapore Lounge which opened in 2013. This replaced the existing First and Business Class lounges as a result of the new Emirates Alliance. All Business Lounges feature seasonal menu choices, snacks and drinks, fully-equipped workstations and internet access, televisions, magazines, newspapers and shower facilities. Qantas First Lounges have multiple seating arrangements to suit your needs, a Neil Perry signature menu, spa treatments (where available), private business suites, a library stocked with magazines, newspapers, internet access and televisions. Qantas Club Members, Gold Frequent Flyers and OneWorld Sapphire holders are permitted to enter domestic Qantas Clubs when flying on Qantas or Jetstar flights along with one guest who need not be travelling. Platinum and OneWorld Emerald Members are permitted to bring in two guests who do not need to be travelling. Platinum Frequent Flyers had previously been able to access The Qantas Club in Australian domestic terminals at any time, regardless of whether they were flying that day. Internationally, members use Qantas International Business Class lounges (or the OneWorld equivalent). Guests of the member must be travelling to gain access to international lounges. When flying with American Airlines, members have access to Admirals Club lounges and when flying on British Airways, members have access to British Airways’ Terraces and Galleries Lounges. 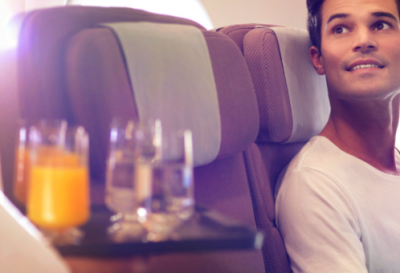 Travellers holding OneWorld Sapphire or Emerald status are also allowed in Qantas Club lounges worldwide. 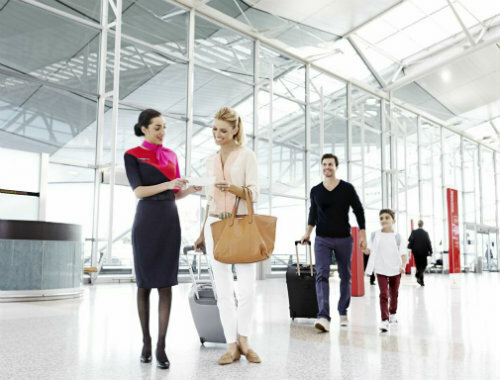 Complimentary access to either the First Class or Business Class lounges (or affiliated lounges) is offered to First Class passengers and complimentary access to the Qantas Business Class lounge (or affiliated lounges) is also offered to Business Class passengers. Join our monthly updates for news and deals on round the world airfares plus tips for on the ground from our RoundAbout Concierge team.